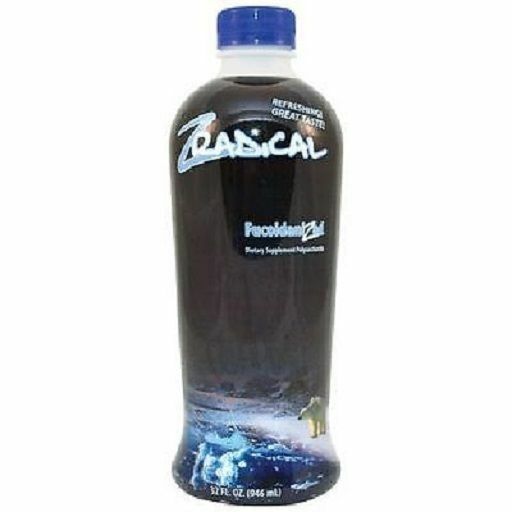 ZRadical™, featuring 50 mg of pure fucoidan, is an advanced biotherapeutic drink. Combining the best of nature and science, this powerful blend is formulated to support immune, cardiovascular, neurological, and joint health. All in a great-tasting drink that the whole family will enjoy. DIRECTIONS FOR USE: Take 1 fluid ounce (2 tablespoons), one to four times daily. Can be taken alone or mixed with juice or water. Refrigerate after opening. Shake well before each use. Best to use within 30 days after opening. WARNING: If you are pregnant, nursing or taking medications, consult your healthcare professional before using this product. KEEP OUT OF REACH OF CHILDREN. Ingredients: Riboflavin, Niacin B3, Vitamin B6, Folic Acid, Vitamin B12, Pantothenic Acid B5, Banana puree, dragon fruit, powder, wolfberry juice concentrate, yumberry juice concentrate, milk thistle, extract, turmeric, Maltodextrin, natural sour apple flavor, natural grape flavor, xanthan gum, mixed wild berry extract, stevia, citric acid, grape seed. * Statements appearing herein have not been evaluated by the FDA. No statement herein nor item purveyed is intended to diagnose, treat, cure or prevent any disease. Proposition 65 – WARNING: Chemicals known to the State of California to cause cancer, or birth defects or other reproductive harm may be present in some products sold here.